Thousands of Moms have been right where you are today. But somewhere between the shock and fear, reality sets in... This is MY Little Girl. I know your shock. I have spoken with hundreds of moms just like you who never thought they would have to face this day with their daughter... There is hope. If you also just learned your daughter is sexually active, then you are dealing with two shocking revelations. First and foremost, take a deep breath, count to ten, walk around the block, do whatever it takes until you are able to consider all this calmly and rationally. Your child's life has forever changed. There is no going back. This can't be undone. Whatever decision she makes regarding this pregnancy will leave a lifelong impact. How you deal with it will leave a lifelong impression. The two most important things right now are controlling your words and emotions, while helping her make an educated and informed decision about the baby she is carrying. My new kit, My Daughter's Decision can help you every step of the way. Best of all, you will get help NOW to help you get started. Please help us. My husband and I just learned our daughter is no longer a virgin. That was shock enough but she's also pregnant and is not sure who the father is. We are beside ourselves. My friend Terry* had heard of your kit. Is it right for us? Today, you are the best help your daughter has. And helping her make the best decision for her and her baby is what she needs most from you. But how do you know what is the best decision? Here is a secret that no one else will tell you... Each pregnancy decision, whether it is abortion, parenting, or adoption involves gains and losses. The difference is the impact of each. Abortion may seem like a quick fix, but the most recent studies on post-abortion patients are staggering -- increased depression, suicide, and even infertility later in life. Unlike adoption or parenting, there is no time frame for changing one's mind -- when it's done, it's done. Parenting is a change in lifestyle and may require sacrificing educational goals and dreams, but your daughter is able to love and raise her child with the baby's father. She will need help and support, and you need to teach her to take responsibility, make a budget, and form a new plan. Adoption can be an emotional journey, but it allows her the choice of adoptive family and to choose to have contact as the baby grows. She is able to walk away from this with pride about how she provided for the life she created, always knowing where her child is and how he or she is doing. Im pregnant and I want to give my child up for adoption. My babydaddy and my mom don't want me to but I feel it's my decision. So Who's Decision Is it? In this day and age, when schools can't give your child an aspirin without written consent, it would seem safe to say that you are the one who makes the call with a minor child, right? Think again! It's not that cut and dry. As her mother, you obviously hold a lot of cards if you are providing her with a roof over her head and food in her belly. Yet you still need to know YOUR rights in the situation. What if the two of you can't come to an agreement on the path to take? Who has the final say? Do you have any say at all? Even if you will ultimately be the one paying the bills? It is questions like these that led me to interview an attorney. This is entitled My Child is Pregnant... What are My Rights? And it contains the answers that you as a parent need. It's part of My Daughter's Decision kit, designed for you and your daughter. But how do you know what's the RIGHT decision? You don't know the right decision until you learn about all of your options. And then, the right one is the one that brings you and your daughter the most peace in your hearts that you are making the best decision for the baby she has created. Now is not the time for anger and speaking out about what she should have done differently. There is no choice but to look forward. That's what the My Daughter's Decision kit is all about... looking forward. Answers to the 10 most frequently asked questions by moms like you. 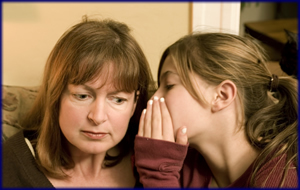 Learn from an attorney the rights you as her mother likely do and do not have. 14 questions for your daughter as she evaluates her ability to become a mom. Stories from girls who have been where she's at. How to receive a FREE labor bag for the hospital. 10 questions to ask herself about the baby's father. Ideas and instruction for journaling as she moves through this journey. Questions and answers about choosing adoption. The steps to making an adoption plan. How to locate a SCHOLARSHIP program for young mothers choosing adoption. Tips to help your daughter take care of herself during her pregnancy. The benefits of choosing open adoption and what it means to your family. A list of celebrities who are touched by adoption. make a decision about this baby! This is not to say that any decision will be easy, but you will both have the tools you need to make a decision that brings the peace in your hearts that you are making the best decision for this child, for your daughter's child. My daughter had an abortion. Thank you for your book, "So I Was Thinking About Adoption." It helped us both learn about adoption and consider other choices before making a decision that can never be undone. AUDIO CD: "My Child is Pregnant, What Are My Rights?" Learn the rights that you as a parent have in your dauther's decisions in regards to her pregnancy. Attorney Felice Webster shares her knowledge and interpretation of the law. This will arm you with what you need to know. 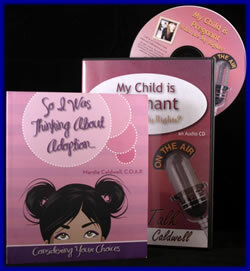 NEW BOOK: "So I Was Thinking About Adoption..."
Short, concise book helps you and your daughter consider options for her pregnancy that include adoption. Get planning sheets, questions for the doctor, and tips for caring for yourself during pregnancy. Learn from common questions and answers from other mom's who have been right where you are and asked the same questions that you likely have. It's pretty likely that these top questions are your questions right now. Get this PDF report right now! BONUS INSTANT REPORT: I'm Too Young To Be a Grandma! Tips for you as you face this situation and move forward. This report will help you with topics regarding the options your daughter has. It will also help you remain calm in the face of the struggles you now face. Get this PDF report right now! This kit is unique and tailored to you and your daughter based on my more than 25 years of working with women like you both. I understand what you are feeling, I know that thoughts going your mind and that of your daughter. And I want to help you both. You are not alone. Remember, the bonus reports are available to you instantly! You have access to some of the best information immediately! Most importantly, My Daughter's Decision kit will ship out right away. You will get the information quickly and in an unmarked, private envelope. Your order is completely confidential. Click here to let me help you on this journey. As an ADDITIONAL BONUS , and because I understand how important this information is, I want to upgrade your shipping to priority shipping free of charge. That's right, you pay for regular shipping and I will send it so you will have this vital information in your hands in only 2 to 3 days. Order today. I guarantee this may be the best decision you ever make. If you want help with adoption right now, please visit Lifetime Adoption Center. If you can't afford the kit or choose not to purchase My Daughter's Decision, help is still available. If you have questions about how your daughter can learn about adoption for her baby or simply learn more about her options, you can call toll free, 24 hours a day at 1-800-923-6784 to ask for confidential help with your specific situation.